Found on the interwebs: Are you a grouch? Your work outlines an observational study, not an experiment. Your study lacks a hypothesis, a control variable, an experimental variable, or validated methodology. Please do not refer to it as an “experiment,” crude or otherwise. Your methods section is (as you admit) crude, but even that lacks important features. Measurement of a inter-scream period to within hundredths of a second suggests an extremely precise analytical system, and variability could substantially alter your results. 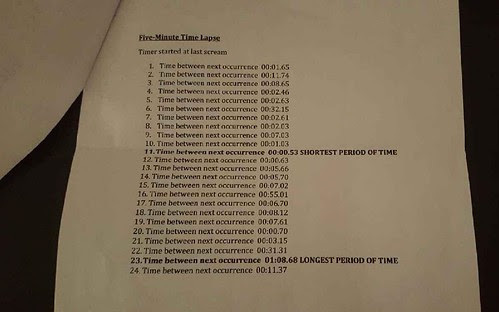 Was your timing system properly calibrated and your start/stop methodology validated? You fail to distinguish between types of scream (happy, angry, in pain, generically loud communication), which could again substantially alter your results. 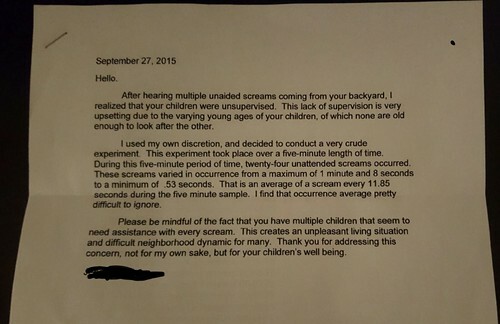 You fail to demonstrate that you were able to distinguish between screams originating from my yard and those of nearby individuals, animals, etc. I suggest you evaluate both positive and negative controls. For example, you could have someone drop a brick on your foot as a positive control for pain screams, you could have someone flip you off for angry screams, etc. I would be happy to assist in these if you require. You link the number and duration of ‘screams’ (subject to the above substantial caveats) to indicating unsupervised children in distress, drawing the conclusion that my children’s well being is at risk. Yet your methodology does not support such a dire conclusion; how can you distinguish between children in distress and children living a full and happy childhood? Finally, you fail to acknowledge previous work in this area by numerous distinguished authors, including Dr. Fuckoff of MYOB University. I cannot imagine having a neighbor like this.